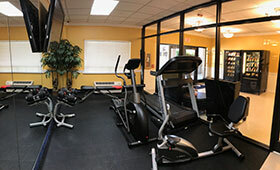 The Asbury Inn Fitness Center is open to guests 24/7. Equipment in the fitness center includes a treadmill, elliptical machine, adjustable dumbbells, adjustable bench, and a 46” TV. Workout towels are also provided. Guests 17 and under require parental supervision. A full weight-room and fitness classes are also available to our guests in the Seminary Student Center. Asbury Inn & Suites has two washers and two dryers available for guest use. The machines are credit card operated and detergent/dryer sheets may be purchased at the ATS Express Shop in the lobby. Three copies of the Lexington Herald Leader are available in the lobby each morning for guests to share. A limited number of roll-away beds and Pack ‘N Play™ cribs are available for guests on a first-come, first-served basis. Roll-a-way beds are $10 per night and there is no charge for Pack ‘N Plays. 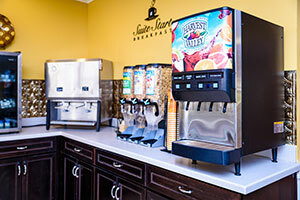 Ice machines are available in both buildings. Snack, Beverage, and Frozen Vending Machines are available in the main building. 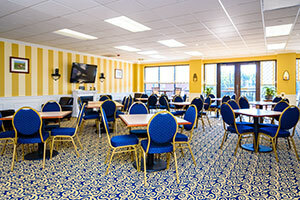 Overnight guests staying at Asbury Inn & Suites may reserve the Great Room free of charge for groups of 10 or more. For more information or to make a reservation, please contact our Event Coordinator at 859.858.2129. A Windows 7 computer is available in the lobby of the main building for guest use. A multi-function printer/copier is available at the front desk in the main building. The first 10 prints are complimentary for overnight guests and additional prints are $.10 each. All packages and mail are delivered to the Seminary Post Office. USPS, FedEx, and UPS packages may be sent to: Your Name c/o Asbury Inn & Suites, 204 N. Lexington Ave, Wilmore, KY 40390. If you are expecting a package, please let the front desk know so we can expect it. First-class stamps are also available for purchase at the front desk. Our housekeeping service is available daily until 1 p.m. to provide guests with clean towels, trash removal. Do Not Disturb signs are available if no service is desired. Whether you need a recommendation for dinner, directions to a local attraction, additional linens, or some fresh-baked cookies, our Hospitality Team is ready to assist. We’re a wealth of local information and we’re always available to point you in the right direction.